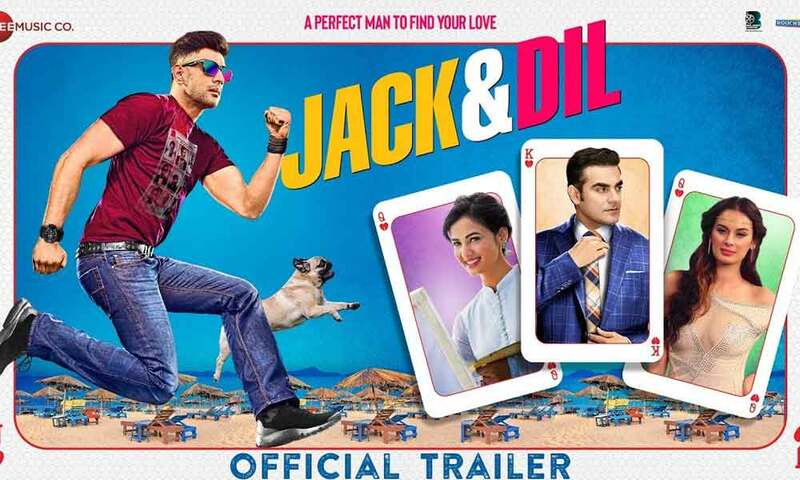 Jack & Dil Movie Review: The Mystery Tale Of Jack Finding His Love Will Keep You Intrigued! STAR CAST: AMIT SADH, ARBAAZ KHAN SONAL CHAUHAN, EVELYN SHARMA ETC. Jack is a young new age man with no fixed income, address, carefree & no material ambition except one, he has to write a detective novel as he has a great passion for reading a detective novel. Story starts when a penniless Jack falls in love with an idea of buying a dog & he gets to know that Mr. Walia, a famous businessman manufacturer of Pressure cooker, has a dog of that breed & looking to sell it. Mr. Walia is stressed because of having a heavy workload & other main thing is that his wife Shilpa has affair. Walia strikes a deal with Jack as he is interested in the detective field. Jack accepts the offer & starts following Shilpa. Jack finds that Shilpa almost daily meets a handsome man & goes with him visiting various flats inthe different building. Jack is unable to solve this mystery – Who is that man & why she visits different flats in different buildings? Suddenly Shilpa finds Jack is following her & she finds that Jack is too innocent & amateur. A friendship grows between them. Shilpa gets to know that he has a girlfriend named Lara-a small model & wants to concentrate on her modelling career, & their relationship is again-off again type. Shilpa gives him some few tips on what women want in a relationship. The deal is on deadline, there is no another option for Jack to find out the mystery if Shilpa is having an affair or not? Innocently he asks Shilpa, Do you have an affair with someone? And short story is described by Shilpa is that she is not having any affair with anyone. Yet Shilpa had a love marriage with Walia. Jack realises that Shilpa is an innocent, kind, lovable girl but neglected in her own house & Walia is an ill person, he doesn’t have the importance of his wife. Jack tells Walia that “it’s me that Shilpa is having affair”. Walia refuses to believe initially but finally he realized that he has lost Shilpa. Jack challenges Walia to woo her back once again. And what’s that challenge? Do jack & Shilpa have affair? Does Walia get his wife back or goes for his big business? Does Shilpa take a divorce or wins Walia back? Does Jack gets the dog & his girlfriend back? Sachin Karande an FTII graduate has earlier made two films Payback and Vikalp which were received very well and received rave reviews. Next articleIndia Witnesses Its First Ever Clash On OTT Platform!